The 2oz. Bottle is ideal for Busy events/days and one full Bottle of Henna Paste will get you through the busiest of days. This 2 oz. Bottle is Soft/Very Squeezable for ease of applying Henna and also has a Large Opening on top for ease in transfering Henna Paste into the bottle. The 1oz. 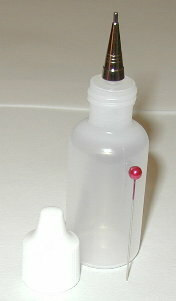 Bottle & Metal Applicator Tip is ideal for most events/days. This 1 oz. Bottle is Soft/Very Squeezable for ease of applying Henna and also has a Large Opening on top for ease in transfering Henna Paste into the bottle. The 1/2 oz. Bottle & 9mm Tip is the Standard Size in the Industry and what most Henna Artists use. It's ideal for use in Fine Line Work & for storing your Mixed Henna Paste in. The 9mm is the Standard Tip Size in the Industry - the 9mm Fine Line Tip will thread onto the 2 oz; 1 oz; & 1/2 oz. Applicator Bottles Seen Above. The 7mm Mid Sized Fine Line Tip has a Slightly Smaller opening than the 9mm and a Slightly Larger opening than the 5mm, the 7mm is ideal for finer detailed designs, the 7mm Tip will thread onto the 2 oz; 1 oz; & 1/2 oz Applicator Bottles Seen Above. The Ultra Fine 5mm Fine Line Metal Applicator Tip is the smallest tip we offer - it's ideal for Intricate/Lacy Designs and the 5mm Ultra Fine Line Tip will thread onto the 2 oz; 1 oz; & 1/2 oz. Applicator Bottles Seen Above. THE LOWER THE GUAGE NUMBER THE LARGER THE TIP. This 18 guage Flexible Polypropylene Tip is 1 1/2 inches long with an inside diameter of 0.838 mm. The 2 oz. Bottle is Soft/Very Squeezable and one full Bottle of Henna Paste will get you through the busiest of days. NOTE: This particular tip diameter is the same as the small coned 9mm tip seen above in Category A. This 16 guage Flexible Polypropylene Tip is 1 1/2 inches long with an inside diameter of 1.193 mm which is slightly larger than the tip above. The 2 oz. Bottle is Soft/Very Squeezable and one full Bottle of Henna Paste will get you through the busiest of days. NOTE: This particular tip diameter is the same as the small coned 7mm tip seen above in Category A. This 20 guage Stainless Steel Tip has a Polypropylene Hub (for threading onto bottle top) and is 1/2 inches long with an inside diameter of 0.609 mm. The 2 oz. Bottle is Soft/Very Squeezable and one full Bottle of Henna Paste will get you through the busiest of days. NOTE: This particular tip diameter is the same as the small coned 5mm tip seen above in Category A. This 19 guage Stainless Steel Tip has a Polypropylene Hub (for threading onto bottle top) and is 1/2 inches long with an inside diameter of 0.711 mm. The 2 oz. Bottle is Soft/Very Squeezable and one full Bottle of Henna Paste will get you through the busiest of days. NOTE: This particular tip diameter is the same as the small coned 7mm tip seen above in Category A. This 18 guage Stainless Steel Tip has a Polypropylene Hub (for threading onto bottle top) and is 1/2 inches long with an inside diameter of 0.838 mm. The 2 oz. Bottle is Soft/Very Squeezable and one full Bottle of Henna Paste will get you through the busiest of days. NOTE: This particular tip diameter is the same as the small coned 9mm tip seen above in Category A. At over Twice the Diameter of a 20g Tip This 15 guage Stainless Steel Tip is IDEAL FOR HUGE DESIGNS!, It's 1/2 inches long and has an inside diameter of 1.371 mm. The 2 oz. Bottle is Soft/Very Squeezable and one full Bottle of Henna Paste will get you through the busiest of days. At over Twice the Diameter of a 19g Tip This 14 guage Stainless Steel Tip is OUR LARGEST AND IDEAL FOR HUGE DESIGNS!, It's 1 1/2 inches long and has an inside diameter of 1.600 mm. The 2 oz. Bottle is Soft/Very Squeezable and one full Bottle of Henna Paste will get you through the busiest of days. At over Twice the Diameter of a 19g Tip This 14 guage Stainless Steel Tip is OUR LARGEST AND IDEAL FOR HUGE DESIGNS!, It's 1/2 inches long and has an inside diameter of 1.600 mm. The 2 oz. Bottle is Soft/Very Squeezable and one full Bottle of Henna Paste will get you through the busiest of days. This is a set of three fine cosmetic brushes which can be used for applying Henna Paste. Cone's or variations of Cone's are a Traditional way in which Henna is applied, this particular Cone is about 7 inches long with a 16mm Plastic Tip (can also be reused). This is a great time saver for those mixing their own Henna Paste, just transfer your Henna Paste into this larger Bottle (has a wide mouth for easy transfer) and store in the freezer - then thaw out & fill your smaller applicator bottles as needed.